Each piece is individually hand forged by skilled craftsmen in our own manufacturing studio for Australian conditions. It's been treated and hand finished with a lovely patina so it won't rust if left outdoors or near the salt air of our coast line and any slight difference in the final finish is due to the hand forged process which we consider to be merits in workmanship. It’s a quality piece you will be able to keep forever. 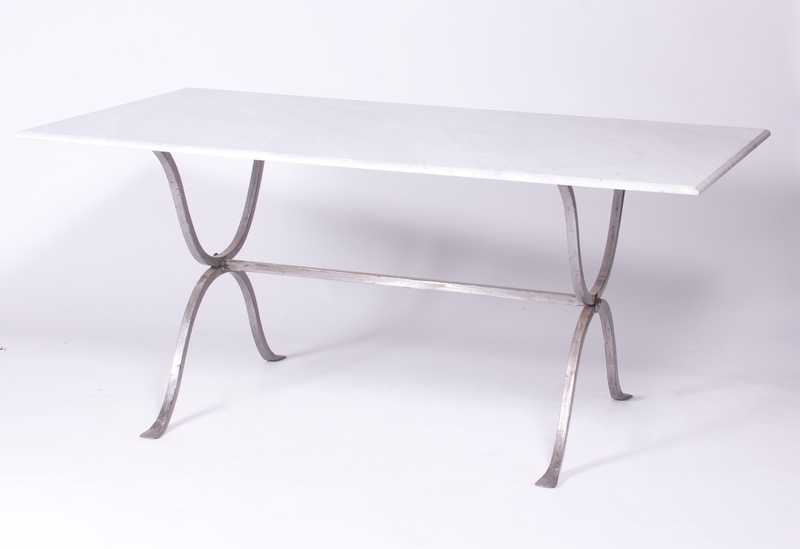 This prestigious and original Le Forge hand crafted steel table base is available with your choice of three elegant tops. Choose from classic Carrara Marble, Glass or Cement finish. Ask our expert staff to help you choose which combination of table base and top will best suit your needs. Our Classic Italian Marble from the Carrara region is an elegant option for your Le Forge steel table base, being a natural product you will not find two pieces the same. It's extremely durable and you can expect it to age and gain character over time. With this in mind we use what is referred to as second grade marble.